A high-volume black mascara that delivers full and perfectly defined lashes. The brush is designed to reach from root-to-tip and corner-to-corner of both your upper and lower lashes for big volume with 360-degree reach. It lifts, and curls even short and straight lashes. Create your ultimate Hollywood look with false lash effect! Size 13 ml/ 0.44 fl.oz. It’s an ideal tool to create both every-day and occasional looks. 3D-effect will make your eyes visually bigger and more expressive. The brush is designed for perfectly defined, curled and lifted lashes. 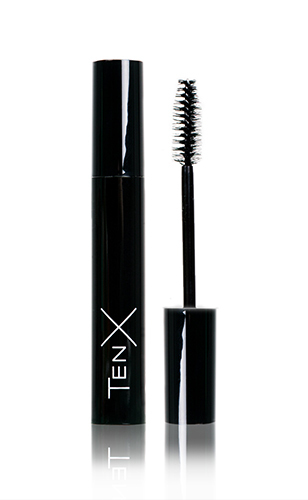 With an elastic, jet-black, long-wearing formula, you’ll flaunt luxurious, silky lashes that won’t smudge, clump, or dry out. Canola oil. Has a powerful regenerative effect, intensively nourishes and recovers lashes, making them thick and strong. Shea butter. Intensively nourishes and moisturizes lashes, strengthening it from the inside. It protects lashes from UV-radiation and negative exogenous factors. Bright, cheeky and stylish girls. Those, who keep up with fashion. Those, who look for trendy colors. Those, who appreciate long wear makeup. 3D effect. Ultimate volume and perfect definition. Rich black color. It is suitable for any type of makeup. Long-wear formula. Smudge- and crumble-proof. Easy to apply. Its elastic texture spreads evenly over the whole length, without clumps. Made in Europe. TenX is created by world’s leading makeup producer. Brush from the base to tips of lashes, spreading mascara evenly with slight, curving movements.